A hatred for fantasy sports, explained. Each year, a group of peers buy two large pizzas and gather at a friend’s house in hopes of drafting the perfect team. Each member is equipped with a soda in hand and a computer on their lap. The members log in to espn.com, and switch off making picks on the draft simulator program, acting like a general manager, mimicking what drafting players in the NFL is really like. Little do they know, not only will their team be riddled with injuries, disappointments, and failure, but they will also have wasted an incredible amount of time in the process. Fantasy football began getting popular in the early 2000’s, though it has been around since the 60’s. This imaginary sport is a sports platform in which a participant picks players who they think will score the most points over the course of the NFL season; all of these selected players are then put on a team that one can call their own. The statistical success of these players determines the number of points received by the given member’s team. For example, if a player scores a lot of touchdowns and gets a lot of yards, with a lot of targets, then they are considered a valuable player because they have the highest point value. Formats for leagues include head-to-head scoring in which you battle against separate opponents each week, total points where your placing is based off of an accumulation of points throughout the year, and dynasty leagues where you keep your players throughout multiple seasons. Fantasy sports stretch to nearly all sports, although fantasy football is easily the most popular. In the end a winner is crowned, gaining the sought after respect from his or her peers, while a loser is simultaneously decided, forcing that person to suffer until the next year of fantasy sports begins. Fantasy football is conducted through ESPN, NFL.com, and other apps, making it an accessible, on-the-go resource to check. Setting lineups for the week has become seemingly equivalent to checking a Facebook feed or posting a tweet. My hatred for fantasy leagues stems from a personal level in which my passion for sports has declined sharply. In seventh grade I went all-in on fantasy sports, with a toe in the water of the NFL, NBA, and MLB. My innocent middle school self put these fantasy teams as the number one priority in my life. I enjoyed having an easy conversation topic and my competitive spirit really enjoyed the idea of beating my friends in sheer sports knowledge. I will always miss the trash talking that occurs on the Tuesday after a game and the easy way to start a conversation with a complete stranger when discussing fantasy sports. But over time my interest level dropped because of my traitorous attitude towards my favorite teams. I drafted players on rival teams, rooting for athletes on the field that I could never imagine having any reason to like. Last year, I even had Tom Brady in one of my fantasy lineups (enough said…). I was now evaluating players based on logic, rather than my emotions and I recognized a problem in that. At this point, I realized that I was doing this for the wrong reasons, and it was affecting the sports I love because I was rooting for my fantasy players rather than my favorite teams. One year later, I wound up not drafting a fantasy team or becoming involved in any leagues. I wasn’t cheering for a useless wide receiver in the opposite conference, I wasn’t praying for a blocked field goal on Monday Night Football, and I wasn’t hoping my favorite team would lose for the benefit of fake pride over my friends. Yet, there is a part of me that misses that competitive bond against my peers. Over the past few months I have been watching sports carefree, without the stress of rooting for specific players. Now, I’m noticing things that I had forgotten to look for, like the play calling, reactions from players, and momentum shifts. I wasn’t thinking about the players in the game, whether the team would run the ball in the red zone, or go for a two point conversion; instead, I was focused on the emotional side of the game and the crucial details. I now pity those people shackled to a limited fantasy experience. Unfortunately, the reality is that fantasy sports are here to stay. There is now a fantasy sports empire, aided by ESPN’s involvement and other websites, such as Rotowire and fantasypros. Celebrities have risen, books have been written, and a new gambling culture has emerged as fantasy sports have grown in popularity. In just the U.S. and Canada, a total of 57.4 million people participated in fantasy sports in 2016, compared to 12.6 million participants in 2005. To the millions who play the game, are you truly happy? Is it you who is playing the game or is the game playing you? The absence of a fantasy team has been a relief to me in terms of the amount of time I now have. Instead of checking my lineups, scouring the waiver wires, and researching injuries, I can now focus more on the important things in my life. 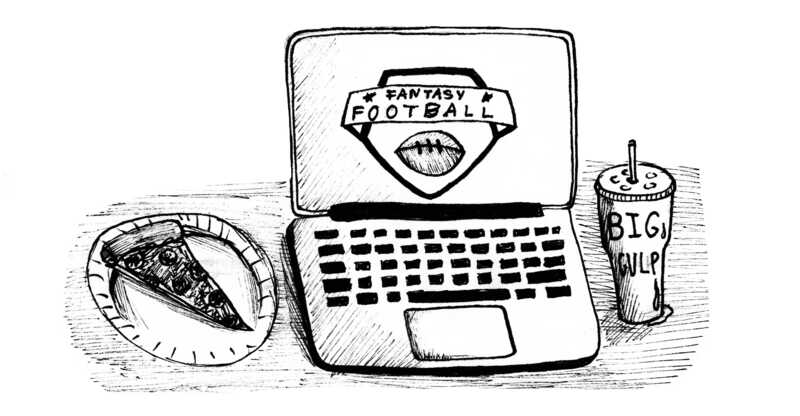 Fantasy sports are something all sports fanatics like me are bound to try out at not point or another, but through all the struggles, heartbreaks, and ego-crushing events, I have decided that is not worth the pain. I care more about my favorite teams than individual players on my fantasy football roster. My retirement from fantasy sports has many positives to it, and I promise it has nothing to do with my last place finish in the 2016 season.